When a person experiences trauma, there’s one key factor that can play an important role in whether or not PTSD symptoms develop – and that’s secure attachment. But what happens when someone has never had a connection to a secure attachment figure? How can we help our client build the feelings of safety that are so vital to healing from trauma? In the video clip below, Pat Ogden, PhD and Ruth Lanius, MD, PhD highlight the importance of repairing attachment. Ruth also offers a useful strategy that can help clients rebuild secure attachment. 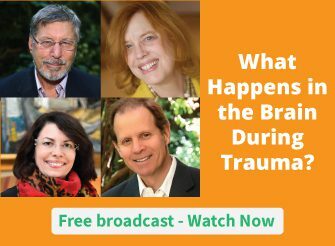 For more on the neurobiology of attachment, please check out the Treating Trauma Master Series. Now I’d like to hear from you. How will you use these ideas in your work with clients? Please leave a comment below. I worked with a seven year old child and her mother. The mother was in a second marriage to a man who didn’t like is wife’s 7 year old daughter and had two tiny children to the new husband. The 7 year old received very little attention and a lot of it negative. We spent the theraputic hour with the mother Havening her daughter as the child chatted about various things. At the end I showed the little girl how to Haven herself. At the end of the session she drew me the most beautiful picture and wrote “Thank you for giving me a sulution (sic) to my problems”. It was clear that Mom had also reconnected to her daughter. Unfortunately the father stopped them coming for more therapy, but I hope that the transformation within that hour and the access to Self Havening has made an ongoing difference and equipped them to manage better.